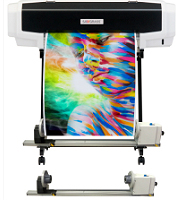 We are delighted to offer the Sawgrass VJ628 25" printer and SubliJet-HD Pro Photo ink set. This eight-colour photo configuration ink set delivers true photographic-quality output, with smoother gradients and shading for skin tones, pastels and black & white images. If you want more information or just an informal chat about this printer and the various options available to you please give us a call on 01404 892995. The Sawgrass VJ 628 printer, the Virtuoso 25” / 630 mm 8 Colour HD Product Decorating System is the industry’s first fully integrated sublimation printing solution of this size. Utilising a best in class print engine, sublimation ink set, software and support, this 8 colour system is designed for high volume, high definition printing - and is built to last, even in the most demanding production environments. Imagine brighter, higher-definition images, with unsurpassed efficiency, ease of use, support AND lower imaging costs. The Virtuoso 25” / 630 mm 8 Colour HD Product Decorating System is ideal for photography, fine art, signs and high-volume customisation and personalisation. Pro Photo 8-Colour supplied as standard - enhanced skin tones, deep, rich blacks and smooth gradients for fine art and professional photography reproduction. Dual CMYK - offers expanded gamut that delivers up to 548,000 colours. Perfect for interior signage, textiles, personalized gifts and promotional products. Pro Photo 8-Colour XF - delivers up to 659,327 colours, with black cartridges (K, Lk, Llk) for extended lightfastness. Perfect for ChromaLuxe panels, professional photo and fine art prints, wall hangings and decor. All inksets offered in convenient and reliable single use cartridges. Easy to use Creative Studio online designer and stock design library. Virtuoso Print Manager is included - easily colour manage your images and organise your work flow. Full catalogue of sublimation blanks at your fingertips. Free sales and marketing resources to help you start and grow your business. Webinars, seminars and guides from Sawgrass focusing on target markets, production and management. PartnerPlus is a comprehensive user support program that fully guarantees Sawgrass’ premium SubliJet digital transfer inks against performance issues or defects. The Virtuoso 25" HD Product Decorating System features the only printers of this size designed specifically for sublimation printing using SubliJet-HD inks. These next-generation printers deliver the highest resolution prints possible for dazzling, photo-quality reproduction - up to 1440 x 1440 dpi! Thanks to an industrial-grade print head, the VJ 628 is built to last - even in the most demanding production environments. Mutoh’s patent-pending i2 Intelligent Interweaving printing technology virtually eliminates horizontal and vertical banding, as well as imperfections from nozzle drops. With a maximum print of 24.3” on 24.8” media, the VJ 628 is the only printer of its size that enables you to print a full bleed on 24” products. This unique combination offers extreme versatility and low start up cost. Virtuoso HD Product Decorating Systems offer some of the lowest start up and imaging costs of any product decorating technology. Combine this with exceptional versatility for creating products that customers love, and Virtuoso systems deliver blazingly fast return on investment. All Virtuoso HD Product Decorating Systems come with a one-year warranty and PartnerPlus real-time total system support for your printer, ink and software - all in one place! The VJ 628’s compact footprint is great for shops with limited space. An optional take-up reel enables unattended, continuous printing. Colour Management Solutions are included with your system, enjoy enhanced free printer software for Mac and Windows platforms, with unique and functional colour output settings optimised for sublimation production. CreativeStudio is Sawgrass’ innovative software suite consisting of the CreativeStudio Online Designer and Virtuoso Print Manager, both of which help creative entrepreneurs quickly and easily produce great-looking designs from any internet-connected computer or tablet. This is included in the purchase price of your printer. Please note that the Virtuoso Print Manager is only available for Windows operating systems. Delivers rich, vibrant colour across a wide variety of image types through printers. Please note that a rip is not included in the purchase price of your printer. The included Virtuoso Print Manager can manage all your output requirements so a rip is not absolutely required.